Becoming a drummer can be an interesting challenge, from experienced instrumentalists to complete amateurs. If you’re thinking about taking up this hobby, you’ve come to the right place. 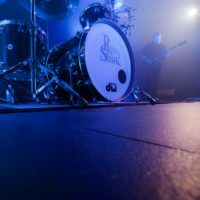 In this article we’re going to cover some practical strategies that will help you start playing drums like a pro. We’re going to talk about the essential habits and steps that you should kick into action today. 1) Start with the basics! When starting off drumming, you should really strive to master the basics before moving onto more advanced methods. For example, learn to REALLY play the basic rock beats, the basic rudiments, etc. You should also try to play beats slowly and build your muscle memory and co-ordination from the ground up. A common way of failing to progress while drumming is by starting too advanced, while they still should be working on the basics. Also, while it’s great to have drumming idols. You should not necessarily try to mimic how they look playing straight away. Truly advanced drummers have a very large range of motion and expression with their drumsticks. However, many drummers tend to ‘over-drum’ with really exaggerated motions on their stick-stroke height and cymbal chokes. Learn good technique first, then you’ll be properly set up to play like a rock star! Getting the right grip is extremely important when you’re beginning to play drums. If you’re a drum kit player, the easiest beginner’s one to use is the matched grip. This is the grip where you hold both sticks in the same way. After a while, you can really start to use the rebound and feel of your drumsticks to do wonders for your drumming. You should try to keep the drumsticks loose in your hands, not chocked up. Not only will this improve your drumming, it will also help prevent injuries to your wrists. The opposite of the matched grip is the traditional grip, which is most commonly used for jazz players and drum corps. 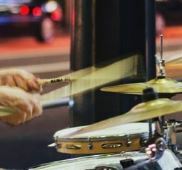 Find out more about those initial drumming grips in this YouTube tutorial for drumming beginners. One of the basic things to learn even before you make your first kick is to learn how to properly sit. 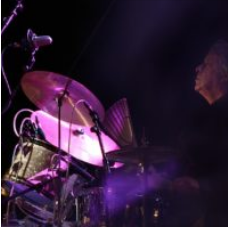 The right posture is extremely important for the later stages of your drumming quest. If you learn how to keep your body straight, you’ll be less tired and exhausted from your playing sessions. It will also help prevent drum career-ending back problems further down the line! For starters, you need to get a suitable drum throne. They come with back and footrests, as well as without these add-ons. Check out our drum thrones guide for more information on this. I tend to sound like a broken record when I preach about ear-protection. As a musician, protecting your hearing is your biggest asset. You MUST wear ear protection while drumming on acoustic sets or playing with a band. There’s no compromise, otherwise you will end up with hearing damage and in-curable, chronic ringing in your ears if you don’t. Giving up is a common thing with every instrument. When you’re starting to play drums, your commitment to this instrument is the key feature that will determine your success. Even if you’re really keen on learning how to play drums, there are some interferences that you can’t eliminate. For instance, if you work and play drums, it’s highly likely that sometimes you’ll have to give an advantage to your job. But regardless of your current situation in life, one thing will ensure steady progress: regular practice. Just like with learning anything else in the world, it’s better to spend playing your drums for a half an hour every day, then to drum 6 hours in a row every two weeks! 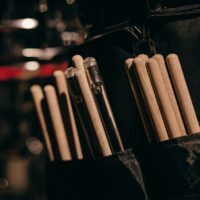 So, you can make a plan every Sunday about your drumming practice for every day of the following week. Even if you have a family, you can squeeze in 30 minutes of drumming a few times a week. It can also help to learn to play the songs you like. Drumming can take you too many different directions. Try to concentrate on the numbers that stir your emotions. Today you can use hundreds of online drumming tutorials that break down songs to tiny details. By doing so, you’ll be more inspired to take a persistent approach to drum practice. Another important thing to do if you want to learn how to play drums properly is to find a local drum instructor. Online lessons are more than welcome, but it’s great to get an initial start with a drum tutor. Because of that, it’s useful to get in touch with a local drum teacher and start attending lessons. For some drumming newbies a few classes will do, while some others might need to keep taking these lessons for a few months. When you’re considering what teacher to hire, take into consideration their references and their teaching attitude. It’s important to find a person who will suit your personality and your musical preferences. Also, the right teacher will know how to inspire you to keep on practicing when you come across an obstacle in the learning process. 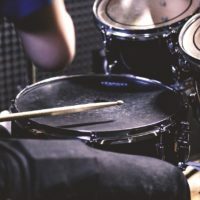 You can read this beautiful story written by a drum instructor and his success with a potential quitter. One of the most important things for a new player of any musical instrument is getting equipped for regular home practice. In case of drumming, the most obvious problem you might have is the noise you’ll be producing. If you live in an apartment building, some of the neighbors might frown upon your new drumming career. As a site dedicated to electronic drums, you might expect that might first suggestion is to grab a set of these straight away. However, I think a drum practice pad is actually the first and most important item to buy. After that, if noise is a problem, you can drum without annoying your family/neighbors/police by using electronic drum sets. You can connect them to an amplifier or hear them with a pair of headphones. That way, you’ll eliminate any disturbing noise, while still getting the genuine drumming feel. 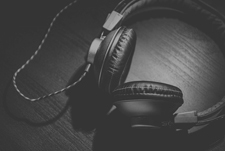 What’s more, you’ll hear the nuances of your drumming progress more clearly if you use the headphones during the practice sessions. 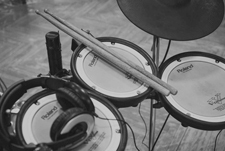 Playing electronic drums at home is also a great option due to the fact that you can adjust the volume of these sets so that you create the optimal atmosphere for relaxed home jamming. A great way to make progress when you’re learning to play drums is to practice with other musicians. While you’ll sometimes need to practice home alone, the next step is getting out of the room and playing with a band. That’s a vital way to improve your skills as a musician, such as fine-tune your drumming pace, listen to the harmonies and adjusting your speed and rhythm with the band. 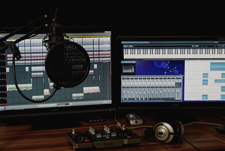 It’s also very useful to try to collaborate with different musicians across various genres. The more styles of music you can play, the more versatile skills will you develop. How do you get involved with other musicians? Drummers are usually one of the more difficult band members to find, so it should be an easy one. Ask around locally, use social media, forums, etc. If all else fails then just try to get yourself out there, go to local gigs and try to get involved with the local music scene. It won’t be long before you start to make friends and contacts. Playing drums is a fun activity in any stage of life, no matter if you’re an aspiring teenager or an enthusiastic adult. Just like any other musical instrument, it requires some time and patience. Also, drums are the backbone of every musical group, since they set the pace for the rest of the crew. That’s why being a drummers demands a special mindset that can carry the band on their shoulders. This mindset is created from the first day you sit at your drum throne, and should keep developing for as long as you plan to keep on drumming! Have any tips on how to learn drums for aspiring beginners? Write them in a comment below!